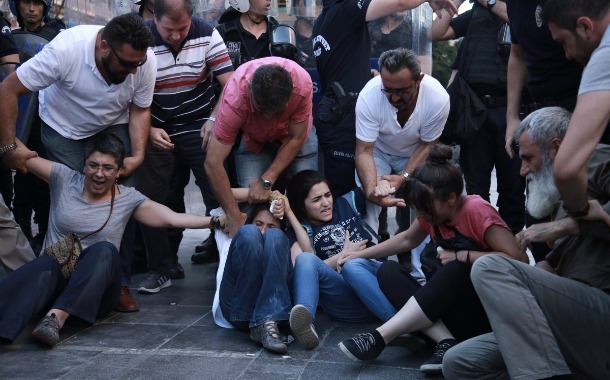 Five protesters who are demanding reinstatement to their jobs by protesting on a street in Ankara have been sentenced to house arrest, the Diken news website reported on Wednesday. Esra Özakça, Acun Karadağ, Nazife Onay, Nazan Bozkurt and Erdoğan Canpolat, who wanted to show their support for dismissed educators Nuriye Gülmen and Semih Özakça and also ask for reinstatement to their own jobs by protesting on the street were sentenced to house arrest by a court. The protesters were previously detained on July 5 and referred to court with a recommendation for “house arrest.” They were released on judicial probation. Upon the objection of the prosecutor’s office the court approved the “house arrest” demand. The lawyers of protester Murat Yılmaz said they would object to the decision. “This decision aims to prevent protests on Yüksel Street. With this decision Esra Özakça, who is on a hunger strike, will not be able to visit her husband Semih Özakça in jail. We will object to this decision,” said Yılmaz. Esra Özakça has been on a hunger strike for 51 days. Gülmen and Semih Özakça, who were arrested on the 75th day of a hunger strike which they started to protest their dismissal by a government decree, have been on a hunger strike for 126 days.